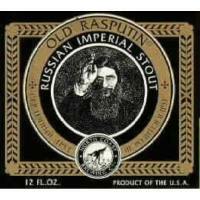 "Contrary to the geography suggested by the name, Russian Imperial Stout was originally brewed in 18th Century England. The name evolved as the Russian Imperial Court developed an early appreciation for this big, intense brew and provided a ready and eager export market. It's been speculated that no one had a greater appreciation for this rich, roasty elixir than Rasputin, the mystic wag (and favorite of the ladies of the court), who contributed to the ultimate downfall of Czar Nicholas II. Rasputin is probably best remembered for his dramatic exit. Having been deemed politically expendable, he was fed poisoned wine and tea cakes by his rivals. Surviving that, he was shot several times - whereupon he attacked his assailants. He finally succumbed when bound and stuffed through a hole in the ice to drown in the River Neva. Legends that attribute his tenacity to his appetite for Russian Imperial Stout are unproven. A rich, intense brew with a robust palate, a fruity nose and a warming finish. Very complex." -- North Coast Brewing Co.
We first experienced this beer at the Yardhouse. The Yardhouse is a chain of restaurants that prides itself on having the most beers on tap. With 250 total taps and 171 unique taps, they will have few rivals. We then experienced this amazing stout at the Library Alehouse in Santa Monica. The Library Alehouse had 17-20 microbrews on tap with bottle of other microbrews and Belgium beers. With Guru Leo in charge, the residents in the area are treated with an amazing selection of microbrews. The appearance of this cascading stout was quite amazing and shocking. After the delicate pour, the glass contained a cascading head within the entire glass. Rippling appearance, like when throwing a pebble into a pond. Pours a dark black muddy body with a large creamy light brown head. Mostly diminishing and excellent lacing. Moderately malty aroma with hints of burnt malts and coffee. Initially heavy sweet taste, finishing with a moderately sweet taste for an average duration. Creamy with a medium to full body with soft carbonation. 75 IBU's. Reviewer's notes: "This was the biggest surprise on our trip - Sean. Off the charts. Phenomenal stout. So good. Amazing. Turning Sean to the dark side - Amber. "Delicioso" - Amber. Delicious aroma. Amazing cascading head - Ian. Reviewed on November 11th, 2006 with Amber at the Library Alehouse, Santa Monica CA.